The 78 foot long fishing vessel Titan ran aground and later sank off the A-Jetty on the Columbia River near Ilwaco, Washington. 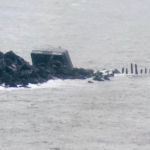 The Titan had ran aground off the Jetty and began to take on water in the vessel’s engine room. The Titan sent out a distress call requesting assistance. 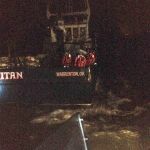 The Coast Guard responded and dispatched a lifeboat from Cape Disappointment and a Jayhawk helicopter from Astoria to the scene. The lifeboat delivered a dewatering pump to the Titan, but it was unable to stop the flooding. The crew donned survival suits and lowered the vessel’s anchor in order to secure the vessel. The five crew of the Titan safely transferred over to the lifeboat and taken ashore. No reports of injuries. The Titan later sank leaving only a portion of the stern above water. Some 3,500 gallons of diesel fuel along with 40,000 to 50,000 pounds of crab were on board the Titan when it sank. Reports state an oil sheen was later spotted around the wreck. 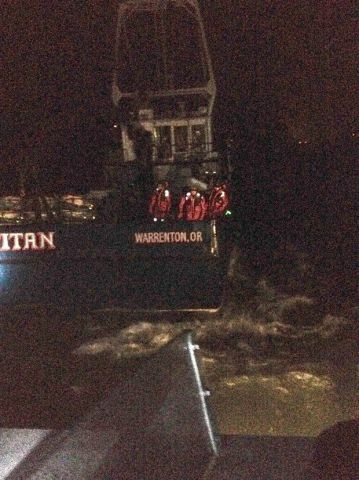 The owner of the Titan has arranged to have the fuel cleaned up and the fishing vessel salvaged. The Coast Guard has launched an investigation into the incident. The fishing vessel Eleon ran aground in Prince William Sound off Evans Island. The Eleon had suffered steering failure and grounded near offshore. The Coast Guard received a partial distress call and launched a Jayhawk to search for the vessel. After the Eleon was located, the 45 foot response boat arrived on scene and towed the fishing boat from the shore. The Eleon was towed back to port. No reports of injuries or pollution released.